What’s my Passover Shtick? Disney. 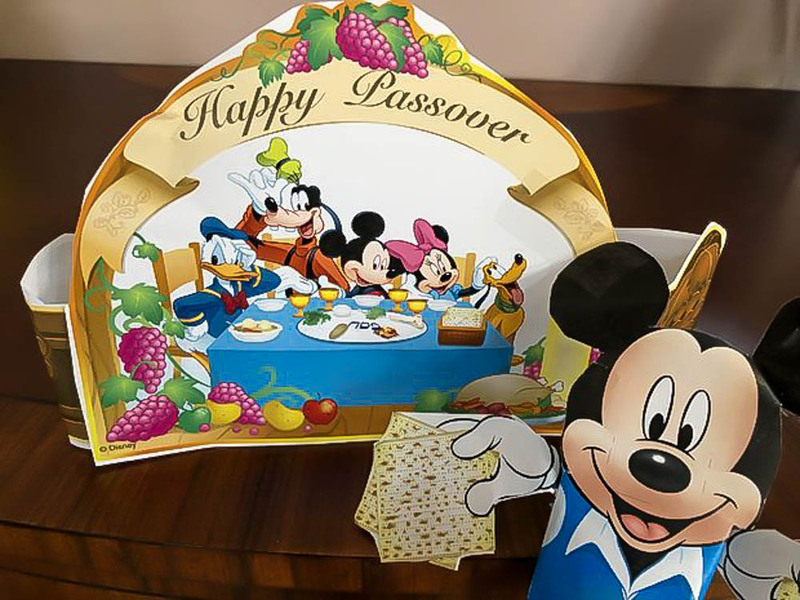 I incorporate a Disney theme every year into my Passover Seder as the host in my home to try to sprinkle a little bit of Disney into our holiday. Each year I try to add a bit more or something different. Our family observes Passover at home, so for our Disney fandom lifestyle this holiday is no exception. This year Passover begins the evening of April 19, 2019. Many families will participate in a Passover Seder possibly Friday night (4/19), Saturday night (4/20) or both depending on tradition. Briefly, the Seder is a reading of the story of Passover in English and/or Hebrew through songs, blessings, and passages at a table with family and friends — in the home or a community place such a synagogue or community center — which includes a Passover meal (typically maztah, minus bread, wine, meat, desserts). Many families share traditions of food and the conduct of the Seder will vary depending on family heritage (from Eastern European or Middle Eastern descent) or sect of religion you practice (Orthodox, Conservative, Reform). If you are unfamiliar and interested in learning more refer to this article. There will be some who host the Seder and some who may be guests. As a host, I will share with you my Disneyfied Seder (typically on night two after the more traditional one). Smatterings of Disney make it more helpful for children — and frankly adults — to sit for lengthy periods of time, especially if observing for two nights. And if you are a Disney family, it adds a little bit of enjoyment to the evening. Yep, Mickey is here, at our Seder. Along with our regular traditions of Judaica and beautiful older table settings I decorate the table with Disney wine glasses (https://www.shopdisney.com/mickey-mouse-icon-wine-glass-by-arribas-personalizable-1311129 or https://www.etsy.com/market/disney_wine_glass), and assign seating using Disney photo clip frames (https://www.etsy.com/market/disney_photo_holder or https://www.shopdisney.com/minnie-mouse-photo-clip-frame-1447726). In the room I subtly place Disney’s Prince of Egypt DVD, Disney centerpieces (https://family.disney.com/search/passover/), a Kermit the Frog stuffed animal or figurine (to represent one of the ten plagues). I will also use small Disney bowls for serving specialty food items (https://www.shopdisney.com/walt-disney-world-mini-bowl-set-3-pc-1439310). I will also place Disney-themed yarmulkes (“kippot” in Hebrew) for those who wear at the table. There are many online with a quick google search, Etsy is my favorite place to find them. Some family members will wear their ears or princess birthday crown hats to add to the theming. Throughout the retelling of the story of the Exodus at the Passover Seder, we use the Haggadah (a book) to help guide us with the songs, blessings, and commentaries throughout the evening. Over the years, some find the repetition of the tunes boring and change it up to tunes that will be modern and relatable (I have seen some for the Hamilton Broadway show theme, for example) but the story will still be the same, just a livening up through modern day songs. The songs can be traditional but we also mash up different tunes and some of them are Disney themed. There are also fun YouTube videos that we can watch (typically not that evening but the prior to it, to get excited for the Seder night) that have been Disney altered to tell the story through modern or child-friendly eyes. And yes, Frozen is indeed one of them. Some are called parodies. One popular one was in 2014, but there are numerous others online. During the Seder, there are adaptations of lyrics to Disney tunes to make the evening more relatable to children as well as adults. It’s basically an evening of what Walt Disney created his foundation on: storytelling. It should not be a night or two of boredom or old tunes people are bored by, but telling the story of the Exodus in any way that will interest the younger generations to repeat it year after year. The traditional game we play during the Seder around dinner hour is finding the Afikomen. The Afikomen, a piece of matzah hidden in a napkin, is hidden in the home and someone such as the children or the grandfather tries to find it — a scavenger hunt. Once found, in our house we pass out small gifts as tradition and eat a piece of the matzah found. So, what would be a small gift for a Disney-themed Passover? I buy Disney gift cards, pins, stickers, puzzles, and ssshhhhh…this year I bought my dad one recycled Disney parks bag from each park (he loves recycled bags)! Bingo is also a game that can be incorporated in between Seder traditions as well as trivia.